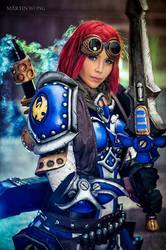 AllieCat is a cosplayer and professional CG animator from Vancouver, BC. She has been cosplaying since summer 2013 and to date has finished an incredible 1st place in every contest she's competed in. From plastics to paints to molding to electronics, AllieCat loves all forms of mediums and strives to utilize and push each to their fullest potential.